The real North Pole, all water and ice. Before 1908, other than Santa Claus, no human being had reached the North Pole, although many had tried and failed. Some had unfortunately died for their efforts. 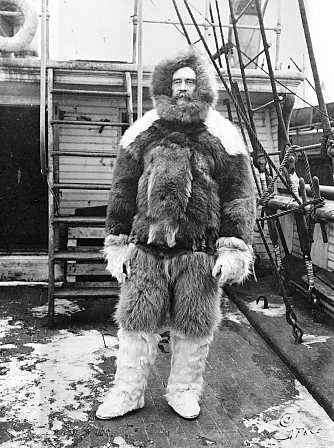 Robert E. Peary in Polar clothes. The other was a Naval officer, with political support from the United States Government and financial backing by the National Geographic Society: Admiral Robert E. Peary. 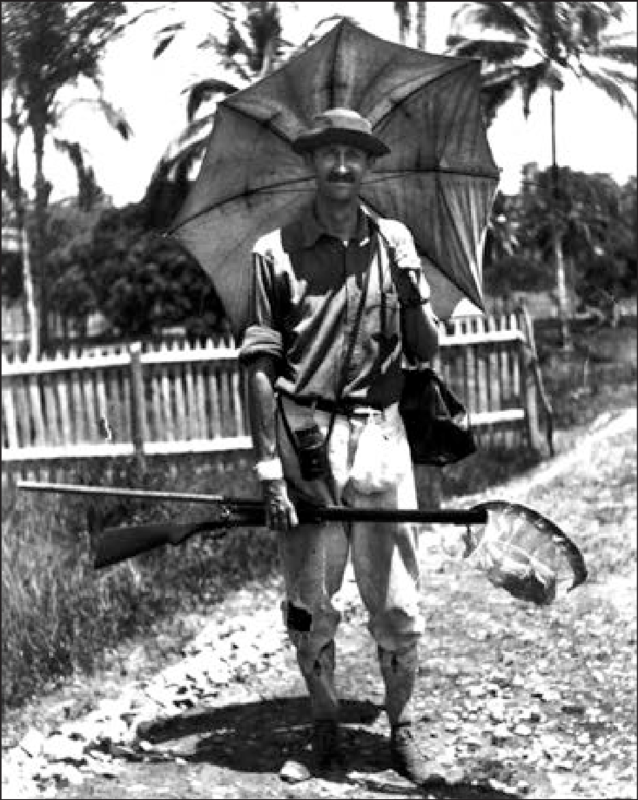 Dr. Frederick Albert Cook, dressed for the Pole. Peary had made two previous attempts to reach the North Pole, in 1899-1902 and 1905-1906, each time reaching farther and farther North. 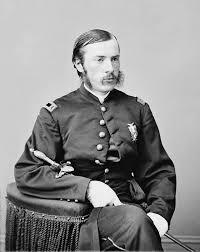 Peary and Cook knew each other, as Cook had been Robert Peary’s surgeon during Peary’s Arctic expedition of 1891-1892. 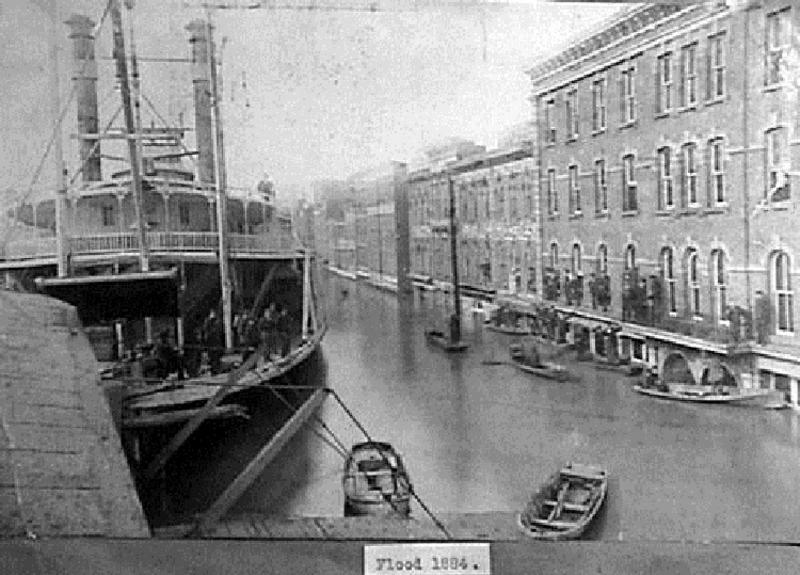 In fact, Cook helped save the crew’s lives when their ship, the “Belgica,” became unexpectedly ice bound. 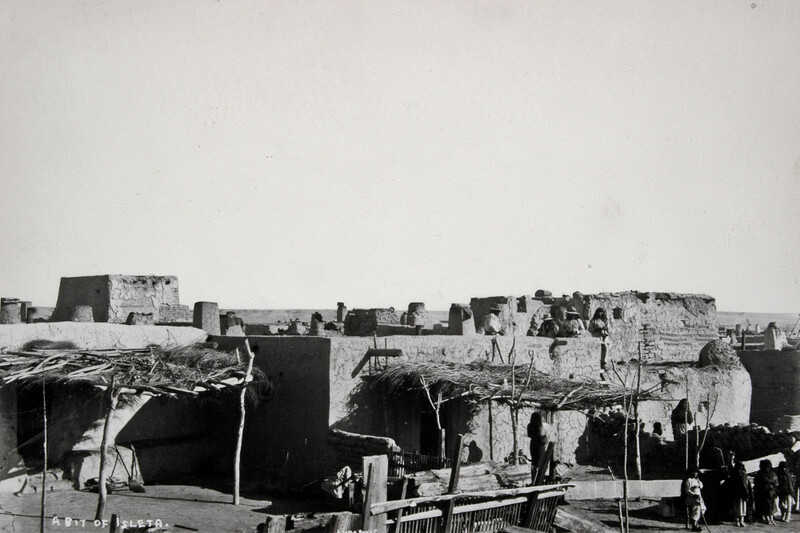 Cook treated the men and hunted for fresh meat to feed them to help prevent starvation and scurvy. 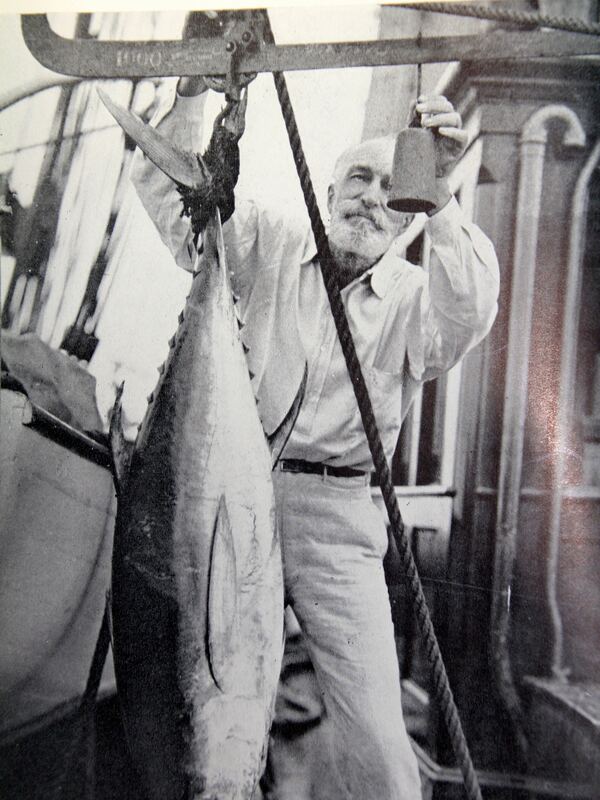 In 1908, Peary was 53 years old. 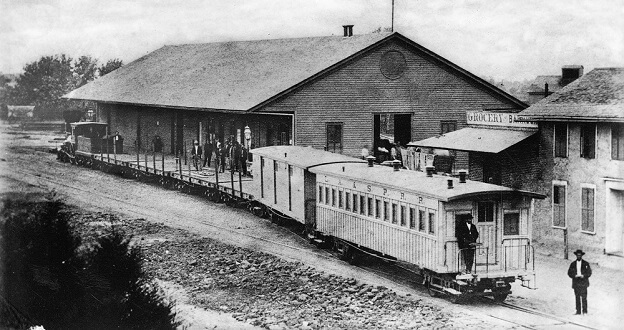 It was thought that a 1908 attempt would be Peary’s last because of his age. 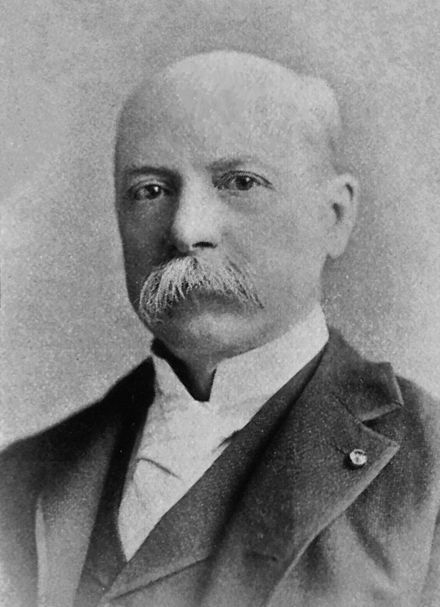 Cook, twenty-two years younger than Peary, might possibly make another attempt if his 1908 attempt failed. 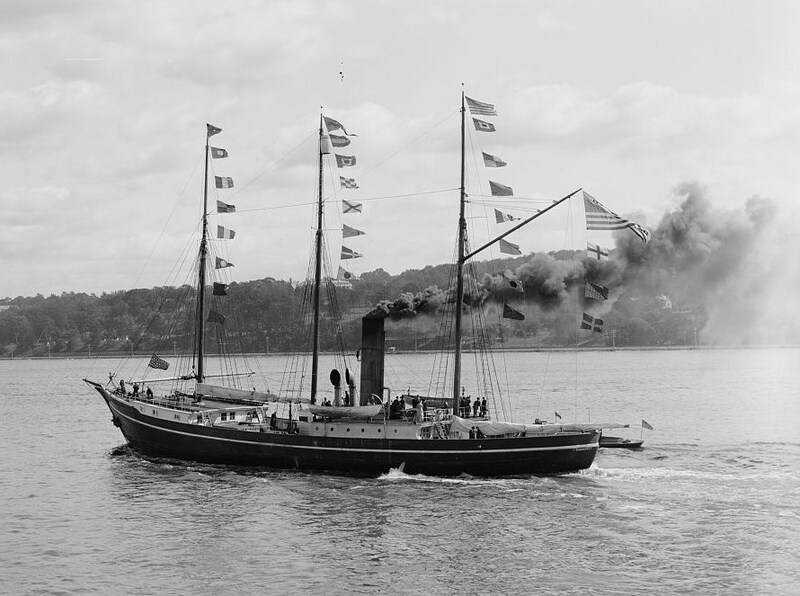 The steamer “USS Theodore Roosevelt” took Peary to Greenland. 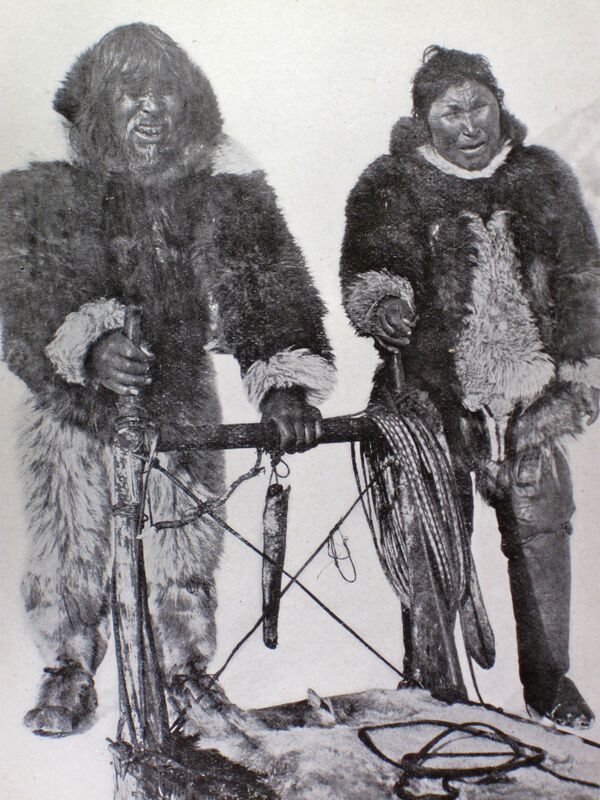 Peary and Cook took radically different approaches to reach the Pole. Extremely well funded, Peary spent whatever he needed to outfit the expedition. 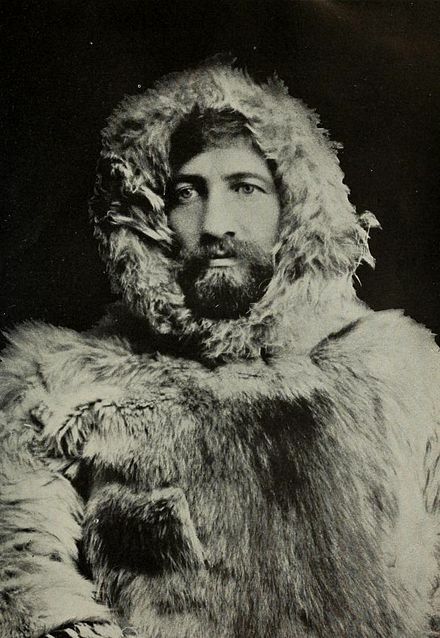 Without funding, Cook thought that a small group, composed of him and several Inuit natives, accustomed to the punishing cold, might make it to the North Pole, traveling light. 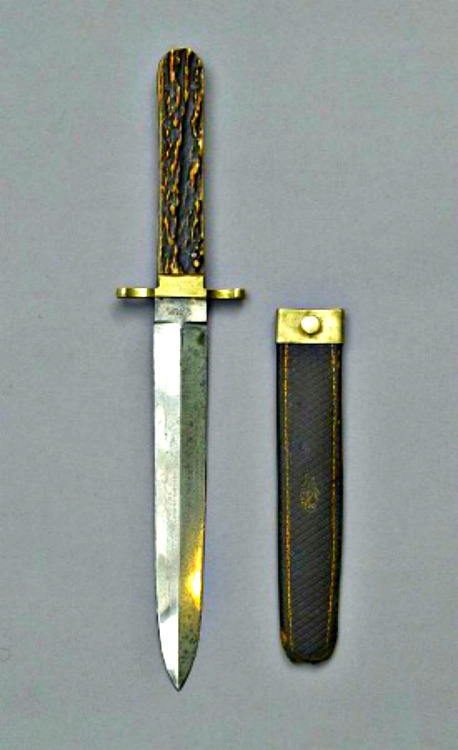 When Peary began his final trip to the North Pole, it was on the comfortable US Navy Ship “Theodore Roosevelt.” When Cook launched his trip, he was lucky enough to catch a ride on a private ship owned by John R. Bradley, a sportsman and hunter, that happened to be going North, taking Bradley to hunting grounds. 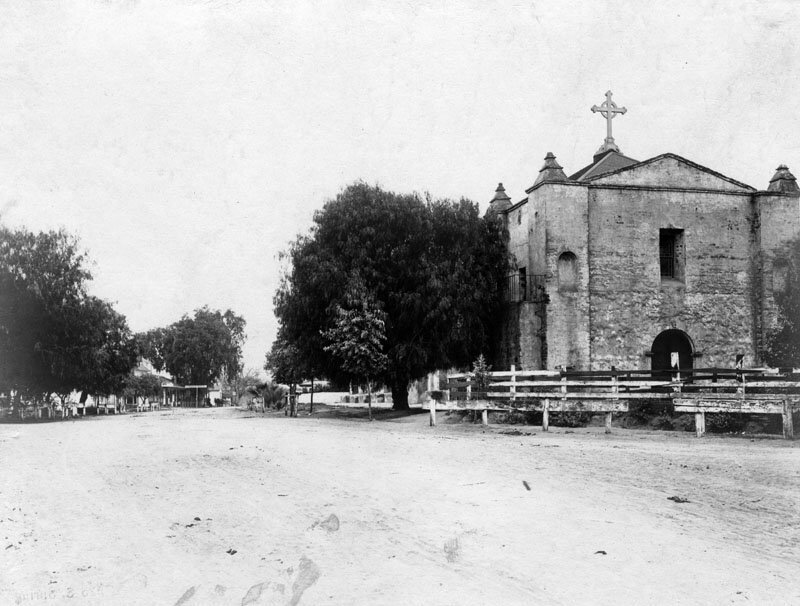 Cook’s Christmas celebration was in 1907, six months before Peary set out for the Pole in August 1908. Cook was in Greenland, preparing for the long journey by foot and dog sled. When Christmas arrived, he was among Inuit people. Although Cook knew the Inuit people had no concept of Christmas, they did celebrate a Winter Feast, which coincided with Christmas. 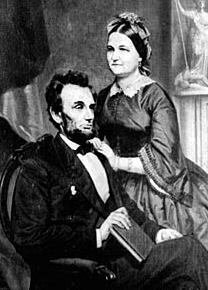 Cook wrote, “ Early Christmas morning, men and women began working overtime on the festive meals which were to begin that day and continue daily. 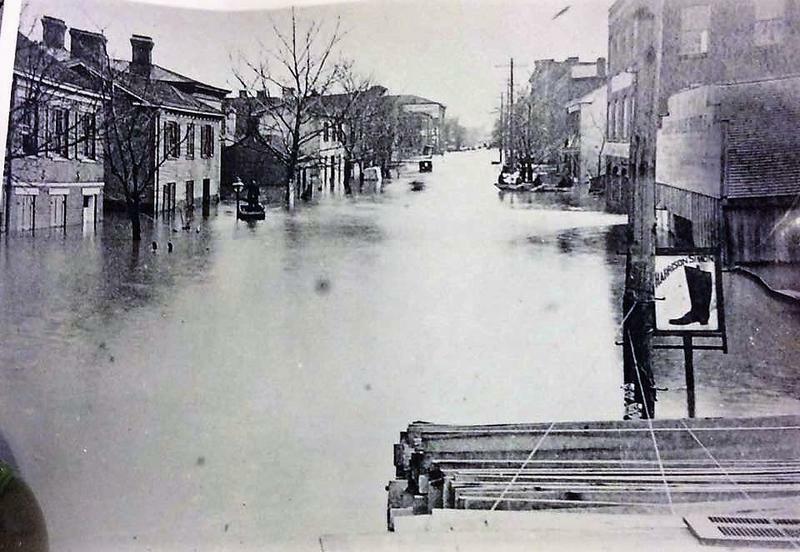 About this time our working force had begun to uncover piles of frozen meat and blubber. Cook ate a western meal. E-tuk-i-shook and Ah-we-lah -Cook’s Inuit companions to the Pole and back, alive. On one special day, Cook reported that a “Boreal stork” had arrived in the community. 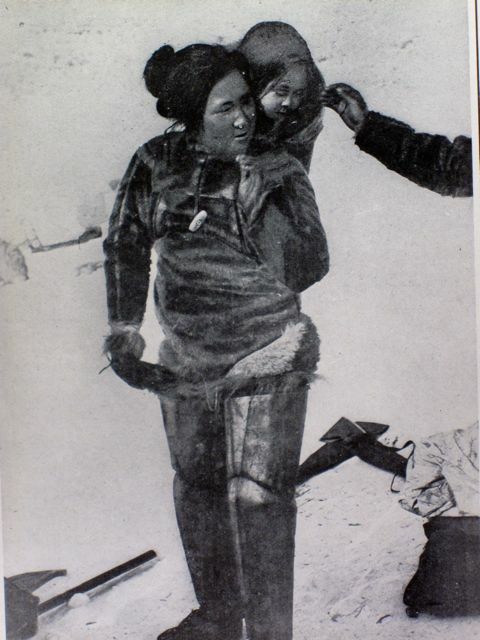 One of the Inuit women had just given birth. 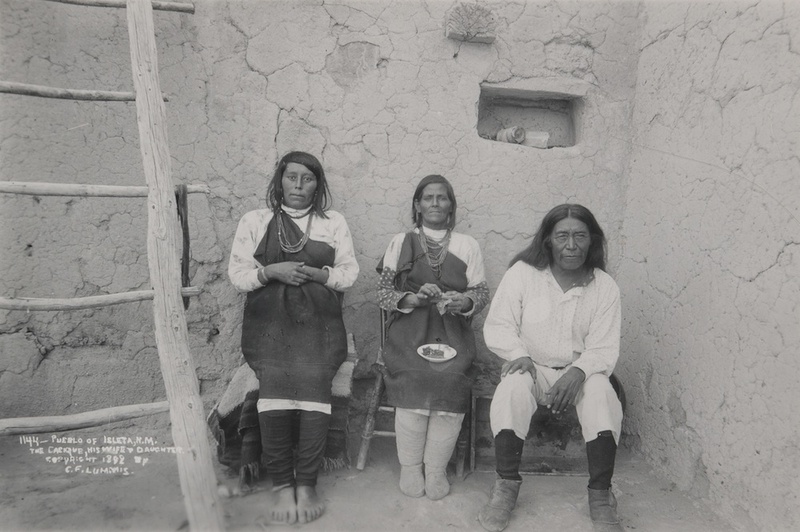 Cook was very much involved with the Native People. His choose two of these people as his companions from Greenland to the North Pole, E-tuk-i-shook and Ah-we-lah. 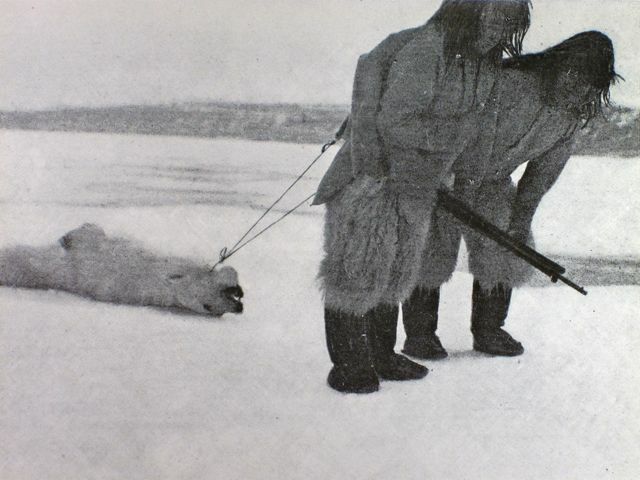 He would trust his life to these Inuit men. 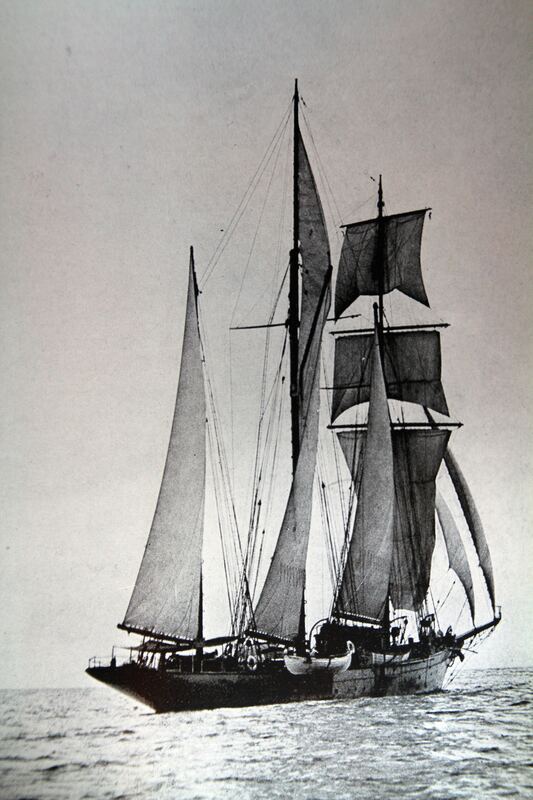 December 1908, a year after Cook left Greenland, Admiral Peary arrived in Greenland. Instead of living in the nearby igloo village, as Cook had done, Peary and his exploration party were comfortable aboard the “USS Roosevelt,” keeping separate from the Inuit people. The Peary party sponsored foot races for the Inuit people during the day. Later he handed out prizes to the various winners in a manner that demonstrated a condescending attitude toward the native people. 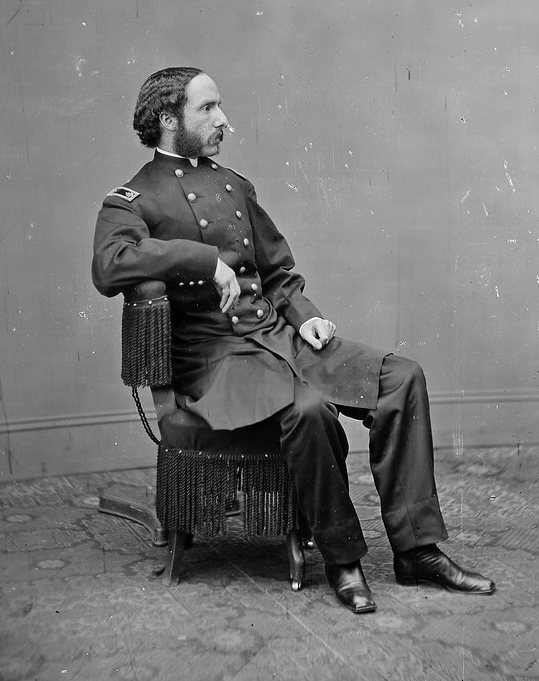 Peary wrote, “In order to afford a study in Eskimo psychology, there was in each case a choice among three prizes. Tookoomah, for instance who won in the women’s race, had a choice among three prizes; a box of three cakes of scented soap; a sewing outfit, containing a paper and needles, two or three thimbles and several spools of different size thread; and a round cake covered with sugar and candy. A week later, Peary, like Cook a year before him, left Greenland for the journey to the North Pole. For both men, Christmas marked the end of preparation and the beginning of the long ordeal toward the North Pole. 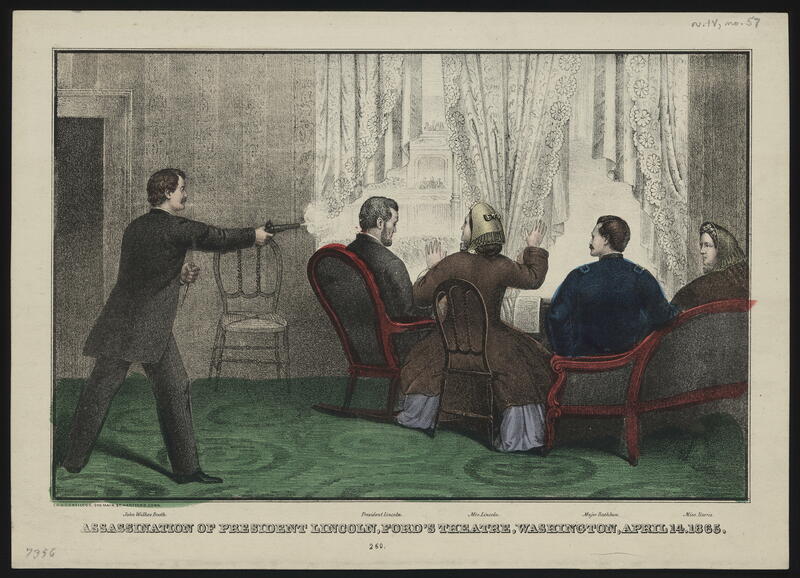 Although they didn’t know it at the time, this was also the end of any friendship they might have forged. After this, they became bitter enemies. 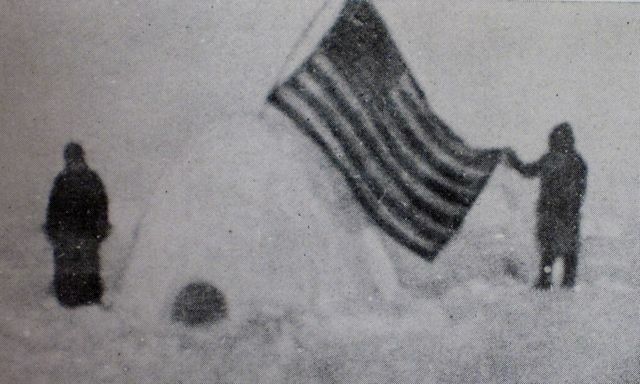 The American Flag flies over an igloo at the North Pole, placed there by Dr. Frederick Albert Cook. On Wednesday, February 19, 1908, Dr. Frederick Albert Cook left Greenland on his quest for the North Pole with two companions, and some sled dogs. 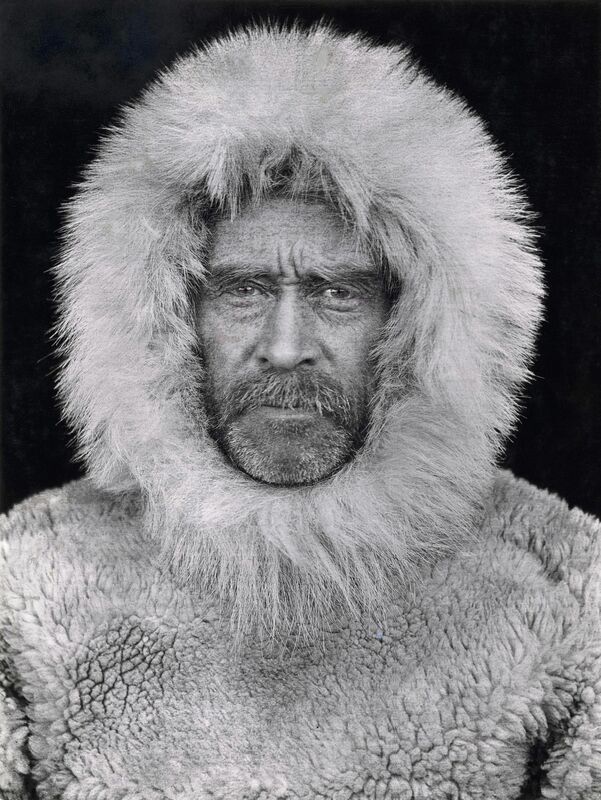 He claimed to reach the North Pole on April 22, 1908 in about 2 months. But it took him almost a year to return to civilization. 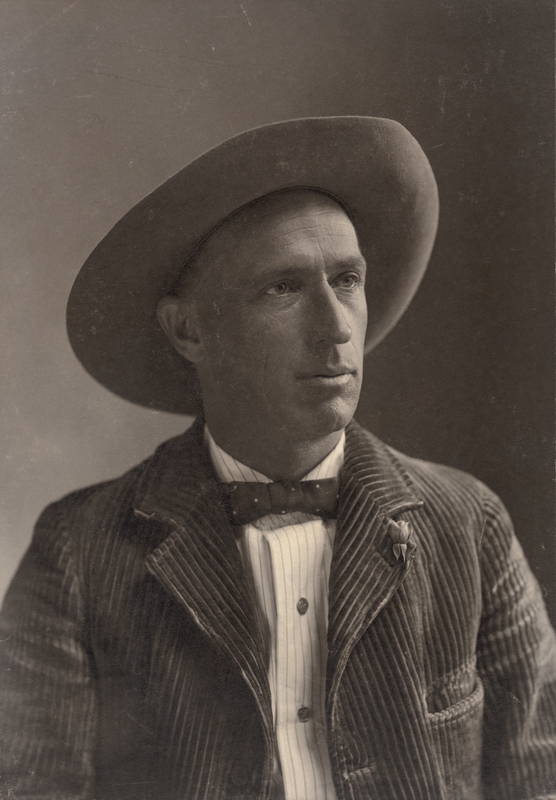 He reported his accomplishments in March, 1909, to the sportsman, Harry Whitney, who was hunting in Greenland. 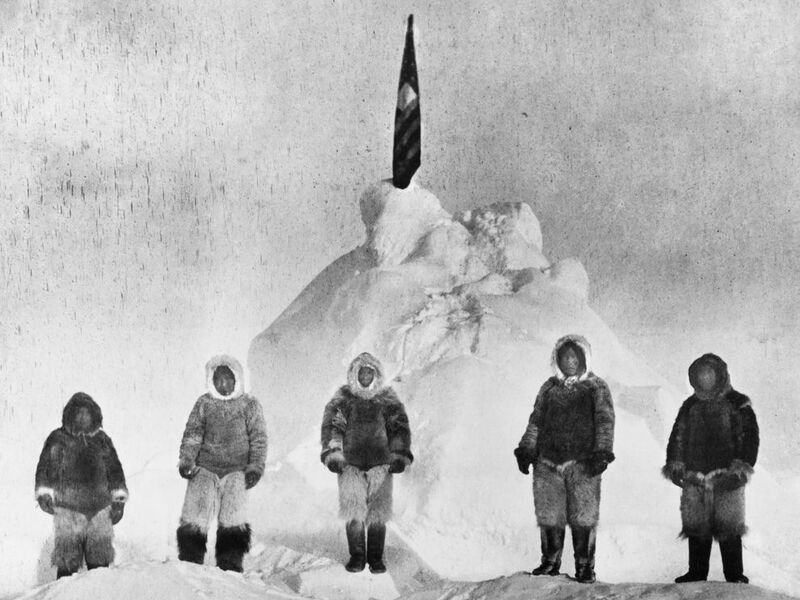 Robert Peary’s party reaches the North Pole in 1909 and takes a picture to prove it. On Monday, February 22, 1908, Robert E. Peary left Greenland, following many scouting parties with much equipment, to move on his quest for the North Pole. 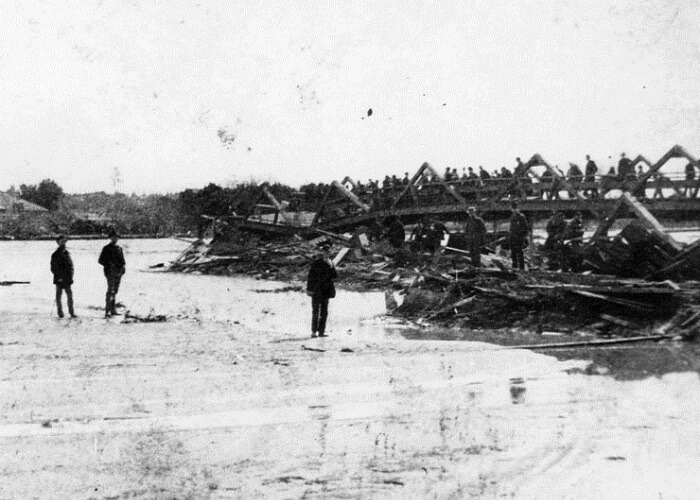 He claimed to reach the Pole on April 6, 1909 – a little over a year later. He was able to report his accomplishment to the New York Times on September 6, 1909. Each of these men claimed to have reached the North Pole. Cook claimed that he was the first. Peary disputed Cook’s claim and set out to destroy Cook’s reputation. 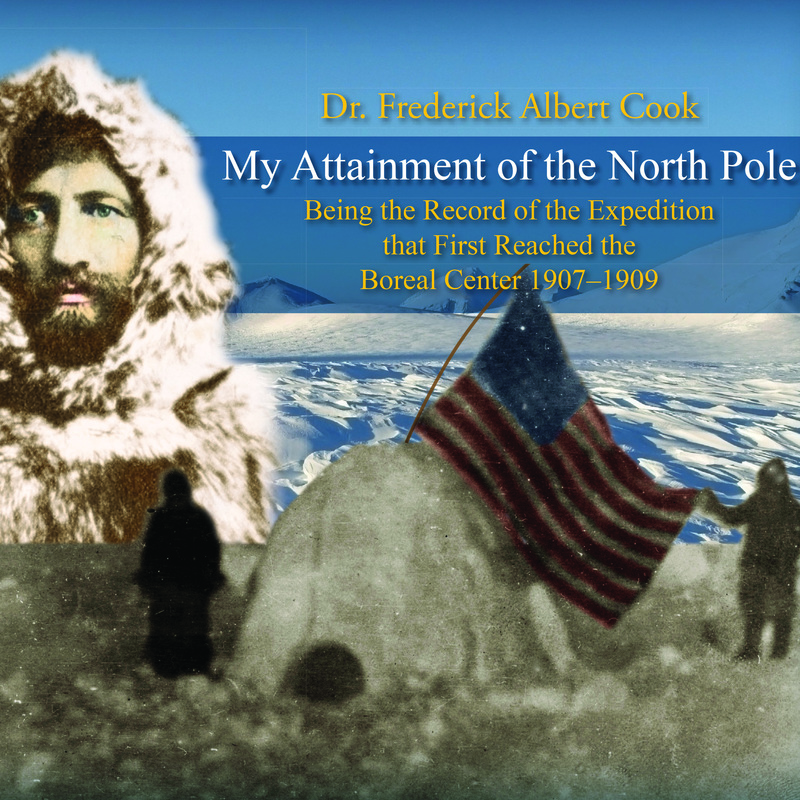 Dr. Frederick Albert Cook spent the rest of his life defending his attainment of the North Pole. Until this time, an explorer’s claim was accepted as fact. 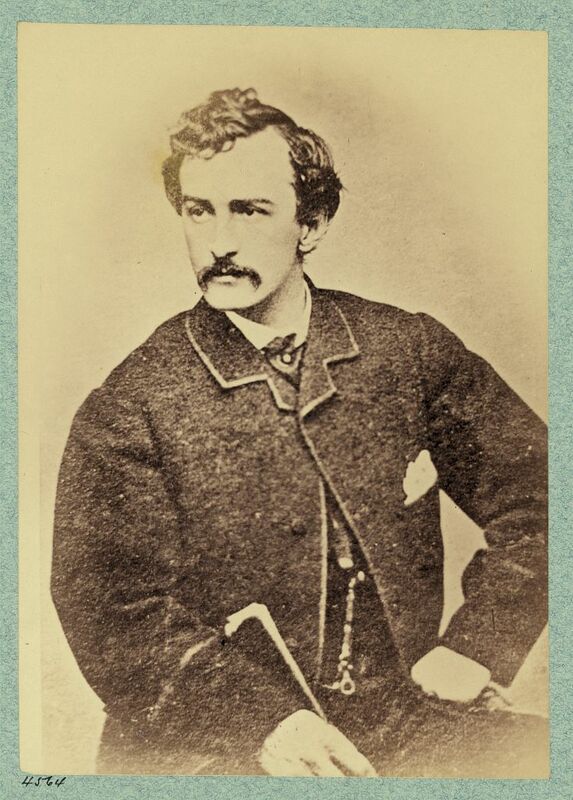 As Peary disputed Cook’s claim, he applied a new level of scrutiny – so severe that his own evidence of reaching the North Pole was placed in doubt. It is possible that neither of these explorers actually reached the North Pole. There was a lot of money at stake. The first person to reach the North Pole would have lucrative speaking tours, publications and other financial opportunities. Because no one had been to the Pole before, no one knew what to expect. 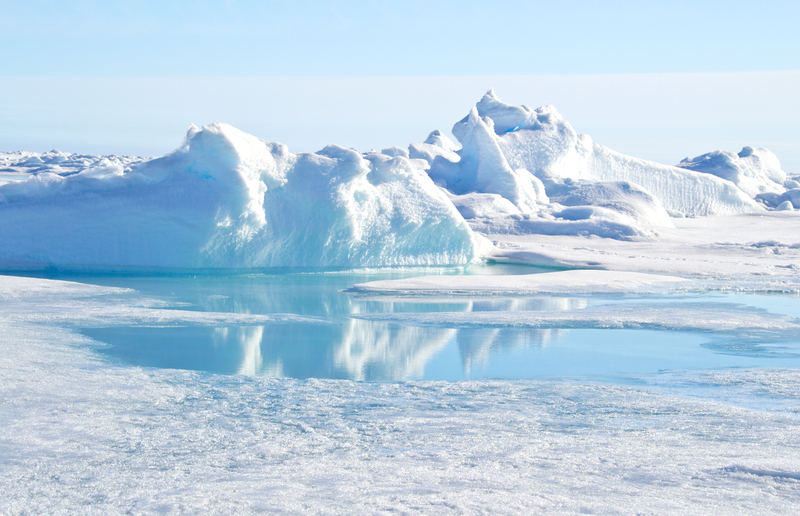 What Cook discovered was that the North Pole and much of the Northern country is actually ice over a western flowing Ocean. There is no solid land at the North Pole. 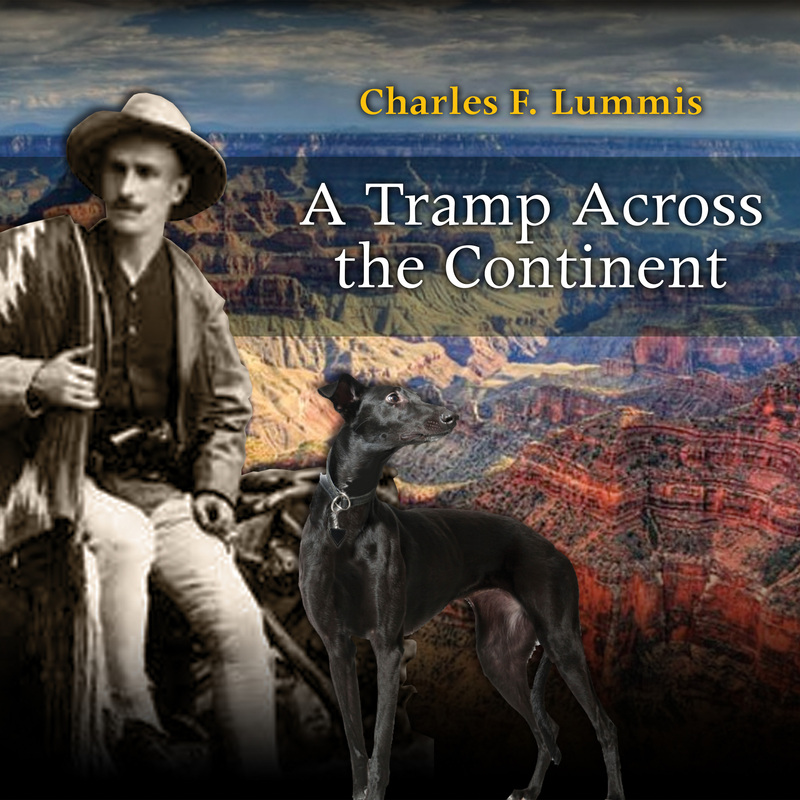 Cook’s return to civilization was a long, dangerous and fascinating life or death journey. All the food Cook had cached for his return to civilization had moved West with the ocean, away from their return route to civilization. None of the food could be reached. Cook and his two Inuit companions had to determine a new route back to civilization, hunting, as they traveled. Their hunting rivals were the Polar Bears. 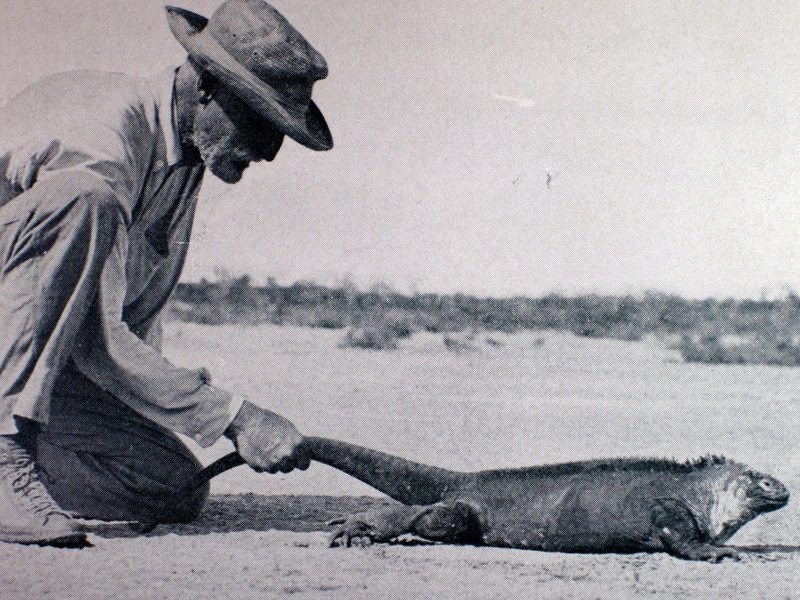 They discovered that man is only superior to wild animals as long as he has a bullet for his rifle. 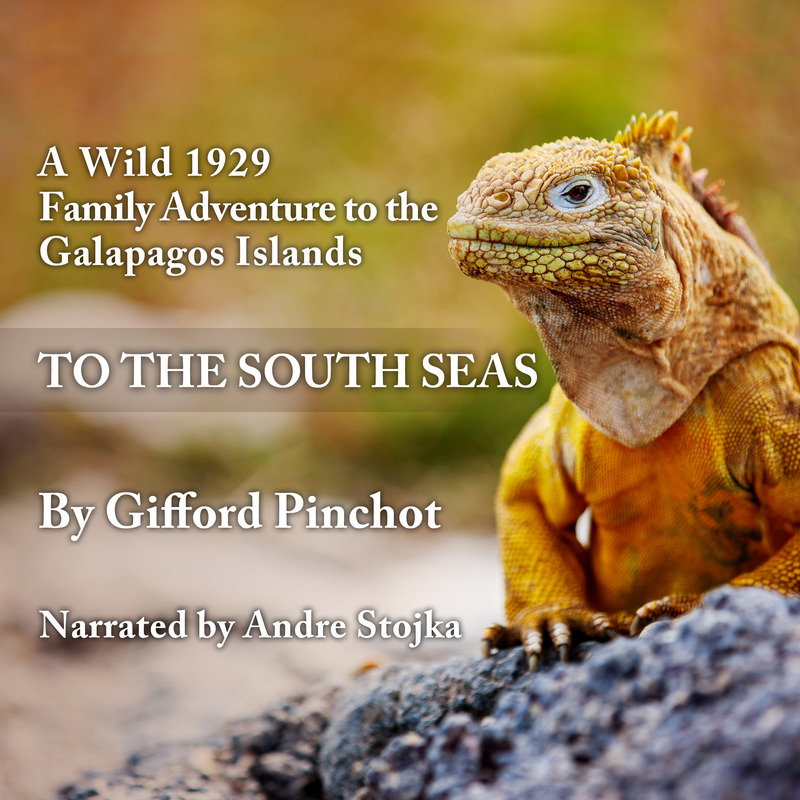 PS: This Holiday Season, I’d like to thank you for your interest and support in downloading or buying a CD of our American Adventure Library audiobooks. It is exciting to experience history, where through acting performances, sound effects and music, we can bring the past to life. Because the world uses more and more oil, discovering more oil keeps the price stable. 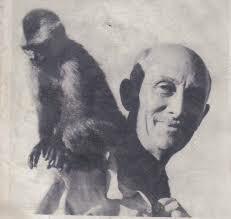 Silently bubbling off the shore of a land, where author William Beebe was busy observing Jaguars, capturing huge snakes, avoiding army ants, watching for rare birds and exploring a fascinating and dangerous jungle that could take his life at any moment, was oil. This black gold, wouldn’t be discovered until a hundred years later. 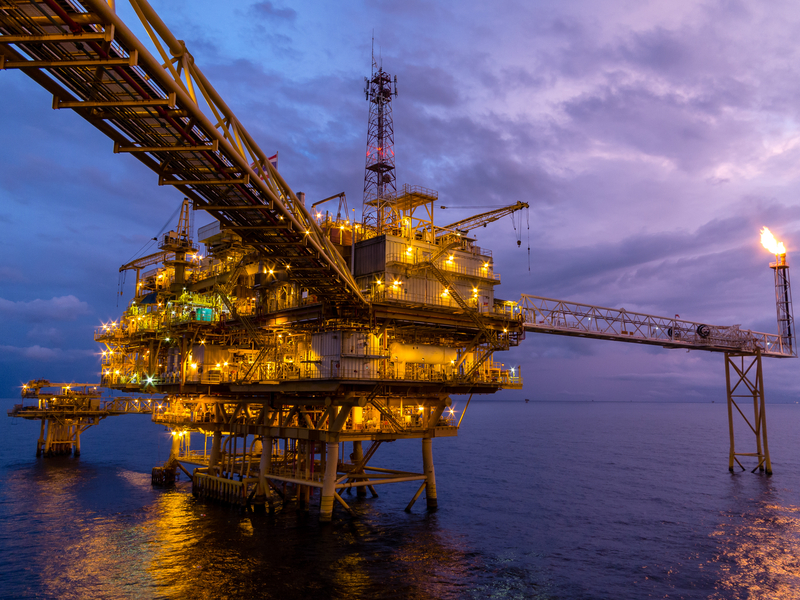 Drilling the seventh well in Guyana began last January 2018. It is a big deal for Guyana and, maybe for us! Steve Greenlee, President of ExxonMobil, expects eventual Guyana production to exceed 500,000 barrels per day. One analyst expects pumping to last for nearly 43 years. When the actual pumping begins in 2020, the Guyana government expects to be collecting $300 million in petroleum funds yearly. Some people estimate this figure could go up to $5 billion a year by the end of the decade. That’s a lot of oil and a lot of money. No wonder there’s a new Hard Rock Café in the Guyana capitol city of Georgetown. 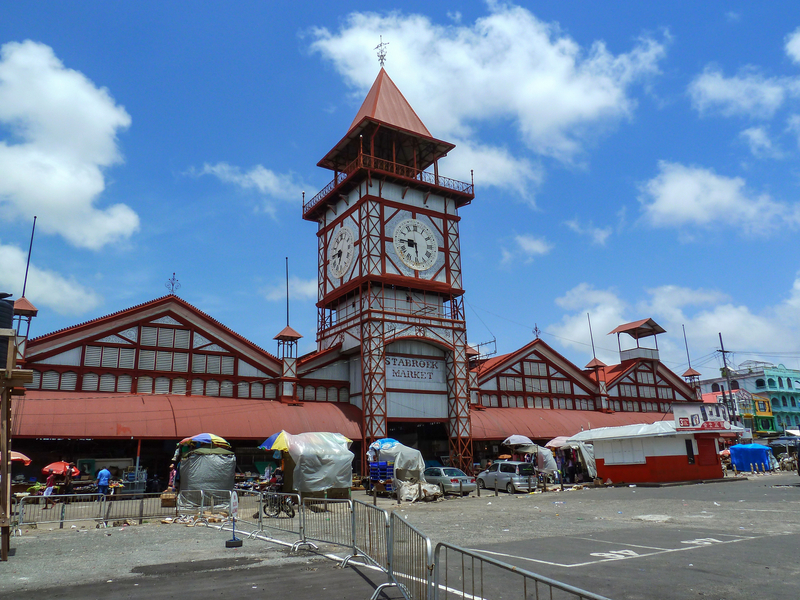 Stabroek Marketplace, Georgetown, Guyana, where a new Hard Rock Cafe is opening. Everybody speaks English in Guyana. 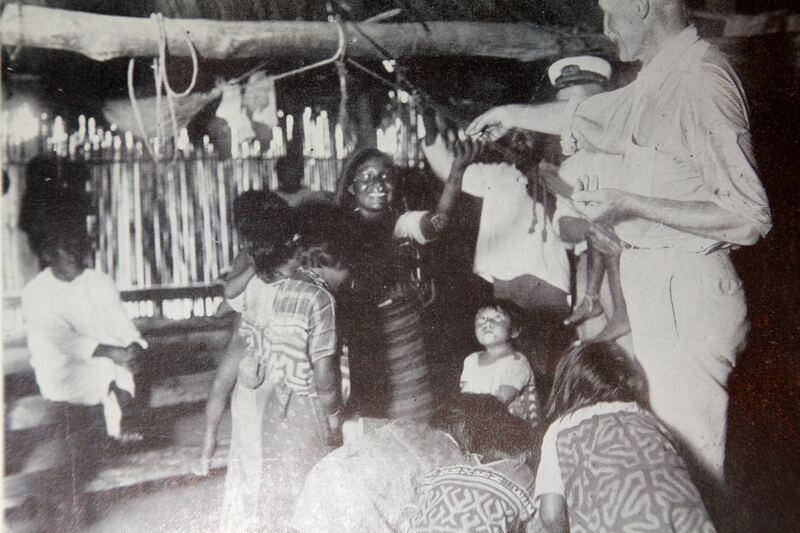 The laws and basic culture of Guyana are British, descending from the days of British colonization. 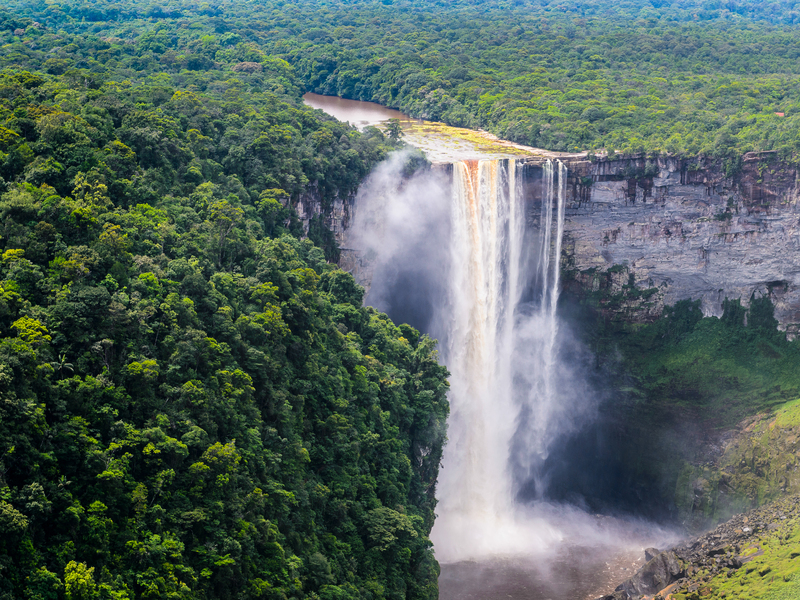 Guyana broke away and became a republic relatively recently, in 1970. The population of Guyana is composed mostly of Africans brought to the country as slaves and set free in 1824, and people from North India, hired as indentured servants, under 5 year contracts to work in the sugar industry, rice fields, and the Bauxite and Gold mines. Culturally, it is an uncomfortable mix filled with tension. Each ethnic group is wooed and catered to by politicians who make, as politicians do, a lot of promises. The discovery of oil will bring jobs to Guyana where the unemployment rate hovers around 11%. It is one of the South America’s poorest countries. 60% of the educated Guyneans simply leave the country for better futures overseas. It is exciting that a new, prosperous oil industry about to take hold could make it possible for Guyana to become a reasonably prosperous country. Oil exploration is a very costly business. In addition to the high cost of discovering and drilling, ExxonMobil gave Guyana an $18 million signing bonus. The only problem might be that small countries with sudden oil discoveries do not have very good track records of handling sudden wealth- Venezuela and Nigeria comes to mind. It is up to the government of Guyana to provide structural support – pipelines, distribution points, processing facilities, shipping docks. Who will get these contracts? What is a fair price? There are a lot of hands stretched out waiting to help. Let’s hope the Guyanese navigate the troubled seas of graft and corruption. 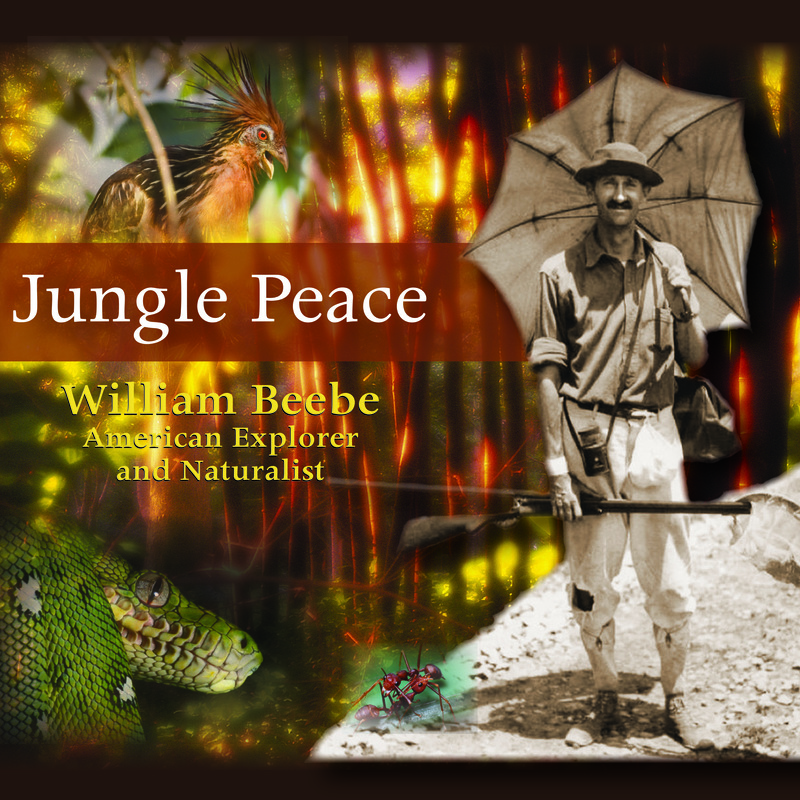 In 1918, the passengers on board the ocean liner “Yamaro” gathered on the deck to see an amazing sight described by Beebe in “Jungle Peace”. 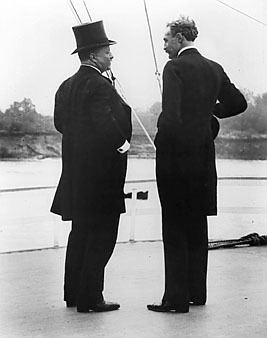 Beebe, was strapped into a harness, attached to a cable. He was slowly being precariously lowered beyond the anchor locker to just above the water line. 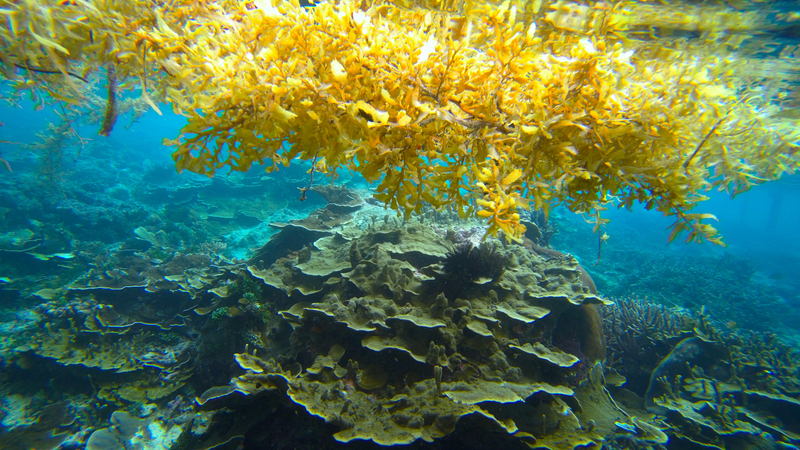 He was studying, first hand, the Sargasso Sea through which the liner cut at a rapid pace. As he dangled there, the water spray in his face, he was collecting pieces of the plant life plant growth floating on top of the waters. It was just another days work for Beebe. 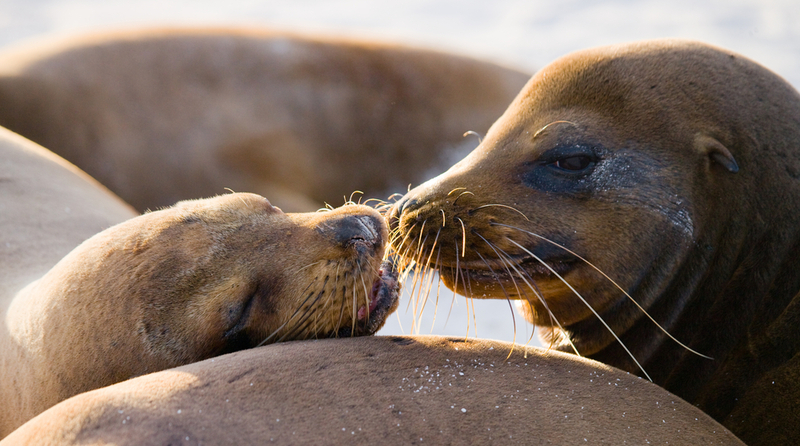 A hundred years later, what is important is not what is on the sea, but what is under it. PS: I loved “Jungle Peace” the moment I read it. I have become a William Beebe fan. He will transport you to another world, in another time, with a lite, colorful writing style that made him famous. 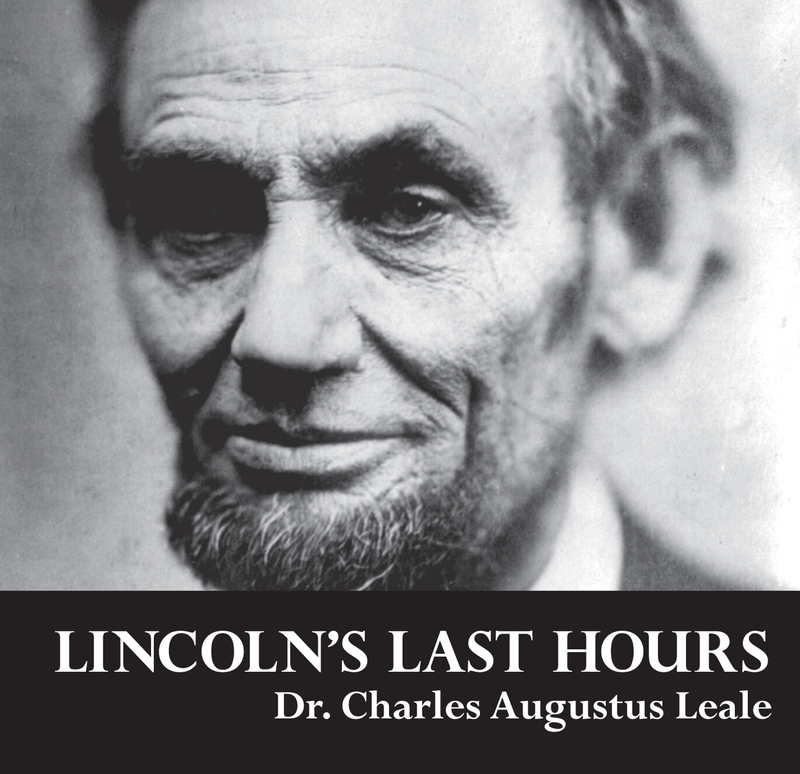 In fact, President Theodore Roosevelt was also a fan and wrote the Afterward of this book. 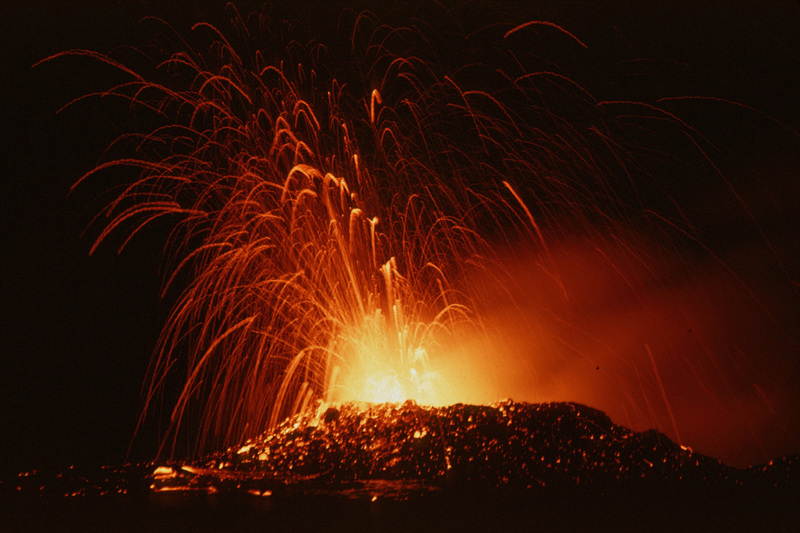 Kilauea erupts on the Big Island of Hawaii (USGS). 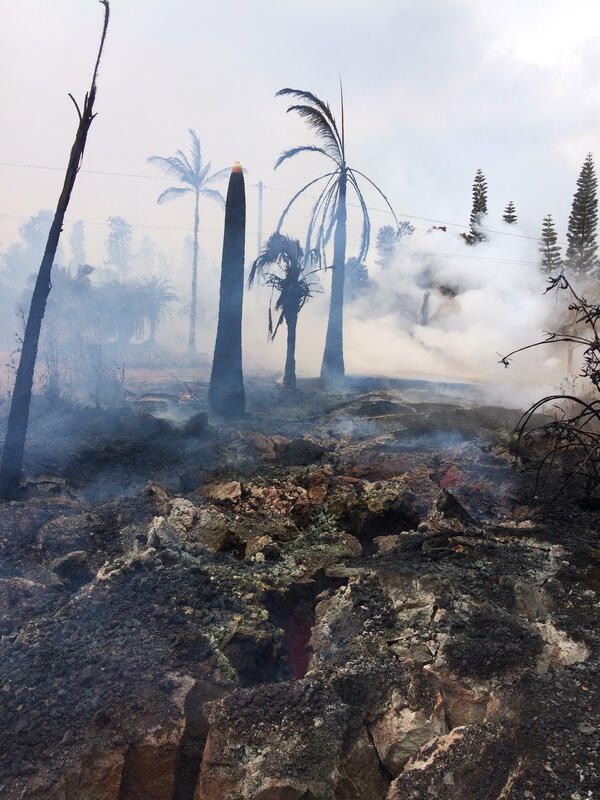 The frightening television pictures of the volcano Kilauea erupting on the Big Island of Hawaii have been tragic, as the lava flow wipes out homes. All of our hearts go out to the islanders, who have or may lose their homes as fissures open up unpredictably. 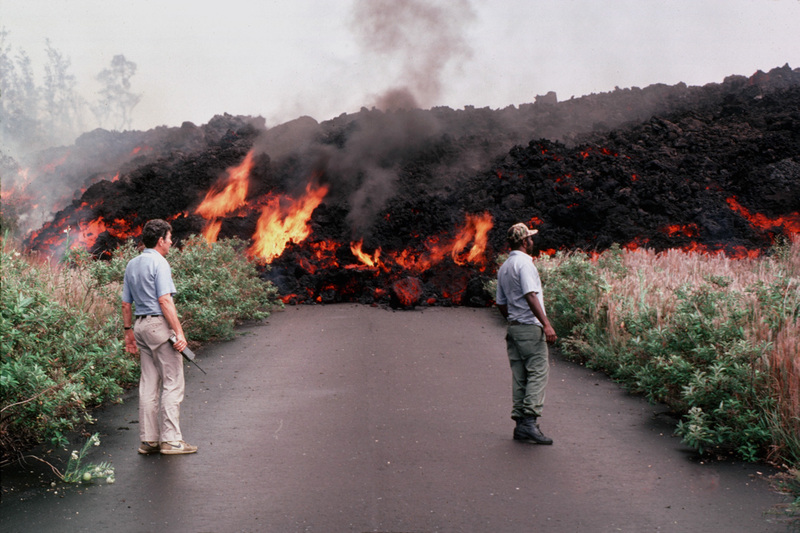 Lava flow wipes out Big Island road a few years ago (USGS). I remember, years ago, driving completely around the Big Island, then suddenly, I couldn’t, because an eruption and lava flow simply wiped out the road. 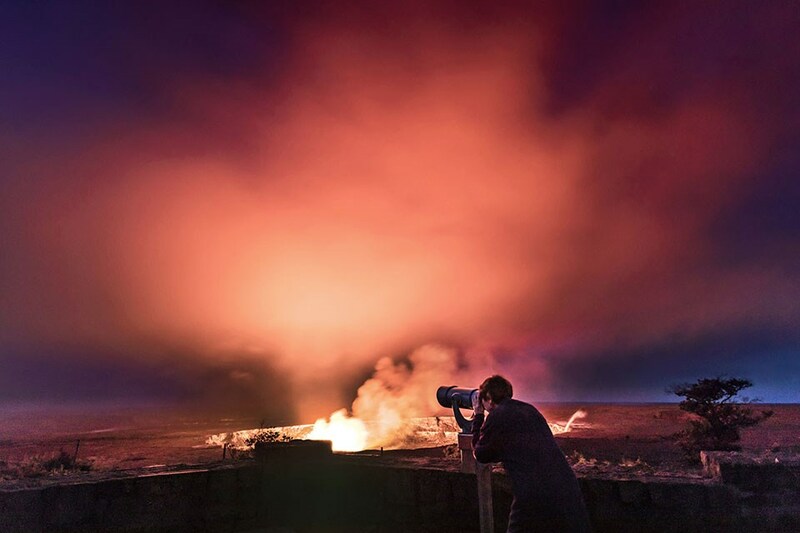 Later, it was a surreal experience as we actually walked out over the freshly hardened lava flow, glowing only a foot or two from us, feeling the heat from the moving orange glow of fresh lava. Some people would go there at night with flashlights. 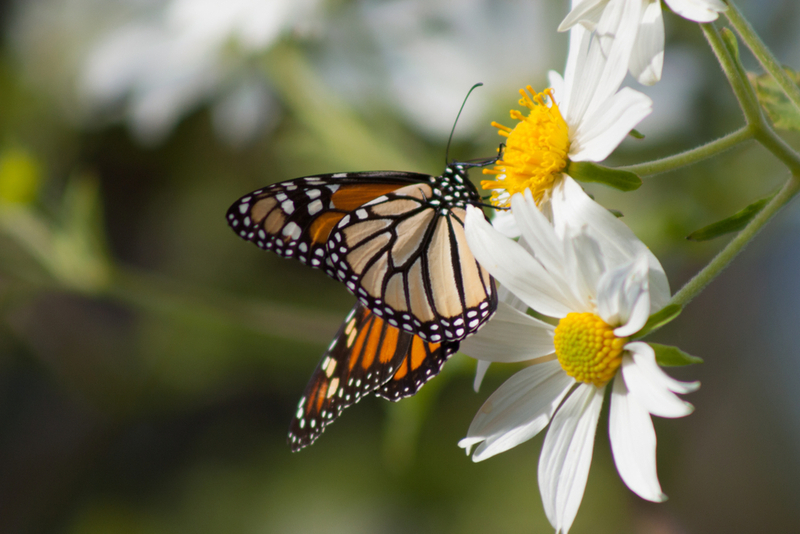 This is nature at its wildest. 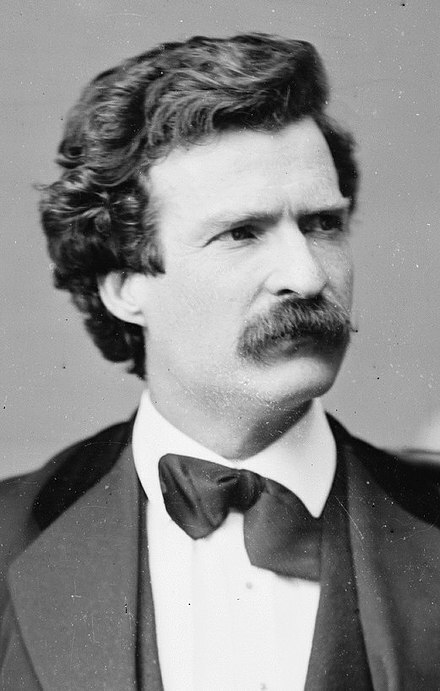 Mark Twain in his younger days. 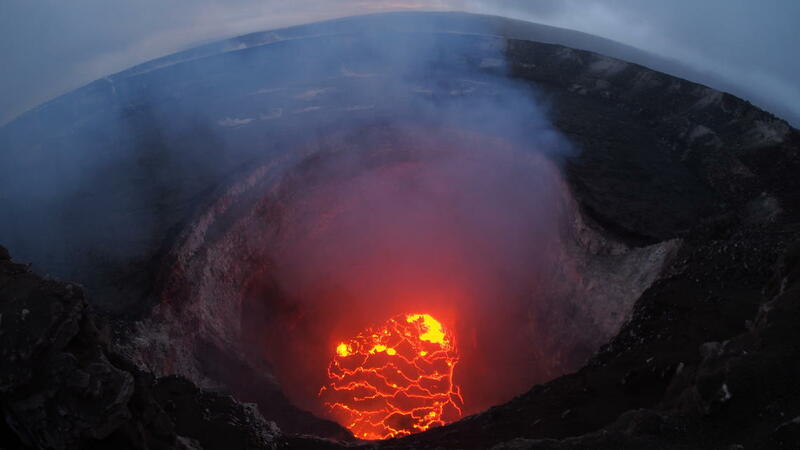 Looking down into the lava lake (USGS). Pele’ is, in Hawaiian mythology, the goddess of fire, lightning, wind and volcanoes. 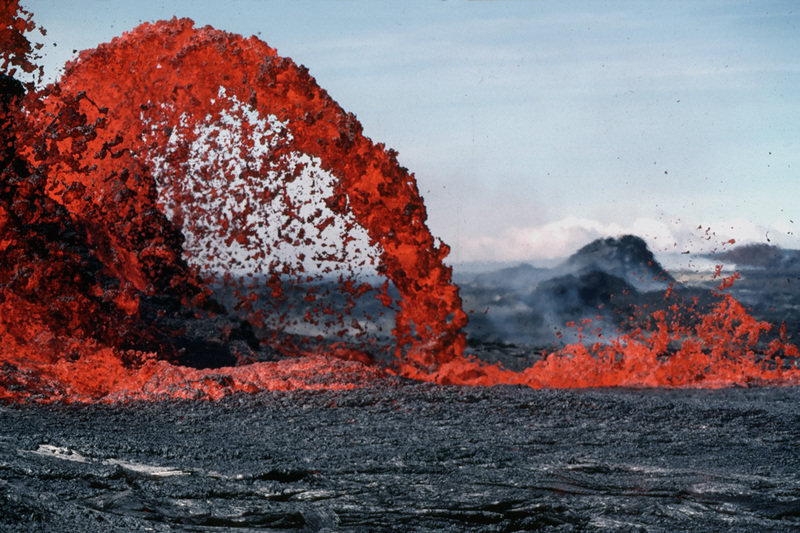 She is a female spirit and it was believed that the eruptions and explosions of Kilauea were directed by Pele’ herself. In 1819, the old native religion and its beliefs was forbidden on the Hawaiian Islands with the advent of Christian Missionaries and the creation of the Kingdom of Hawaii. “Kapi’olani ascended her mountain… and crying ’I dare her, let Pele’ avenge herself! Ground cracks Leilani Estates (USGS). The belief in Pele’ is more widespread than one might imagine. A few years ago, I met a badly bruised gentlemen in a motorized wheel chair, legs in casts, arm in a sling, bandages around his head. He was once the picture of health and now he was a wreck. I asked him what happened. He then told me of the curse of Pele’. It is taboo for anyone to remove lava rock from the Hawaiian Islands as a souvenir or for any reason. “We were foolish,” he said. “ On our last visit to the Big Island, we packed some lava rocks in our suitcases for our garden at home. We removed them from the island and Pele’ has cursed us with bad fortune.” He said this looking directly into my eyes with all the seriousness of a man making a confession. A few years later, having lunch at Volcano House, I was telling the Pele’ curse story to some people. One of the gentlemen told me that recently he mailed a package to the U.S. Mainland and happened to be at the Hilo Post Office. So, Pele’ continues to be alive in many minds. 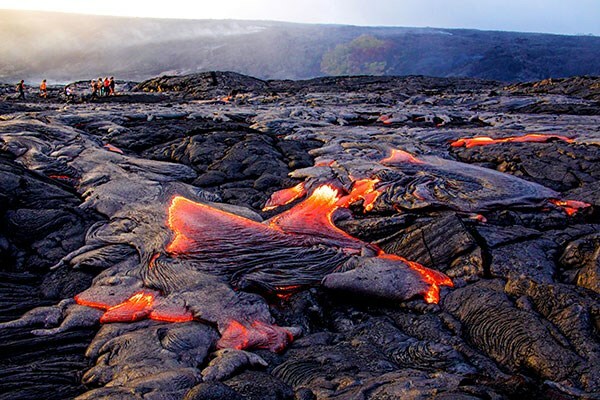 By the way, I don’t think it is a good idea to remove any lava rocks, or any rocks from the Hawaiian Islands. Bad manners, you know. 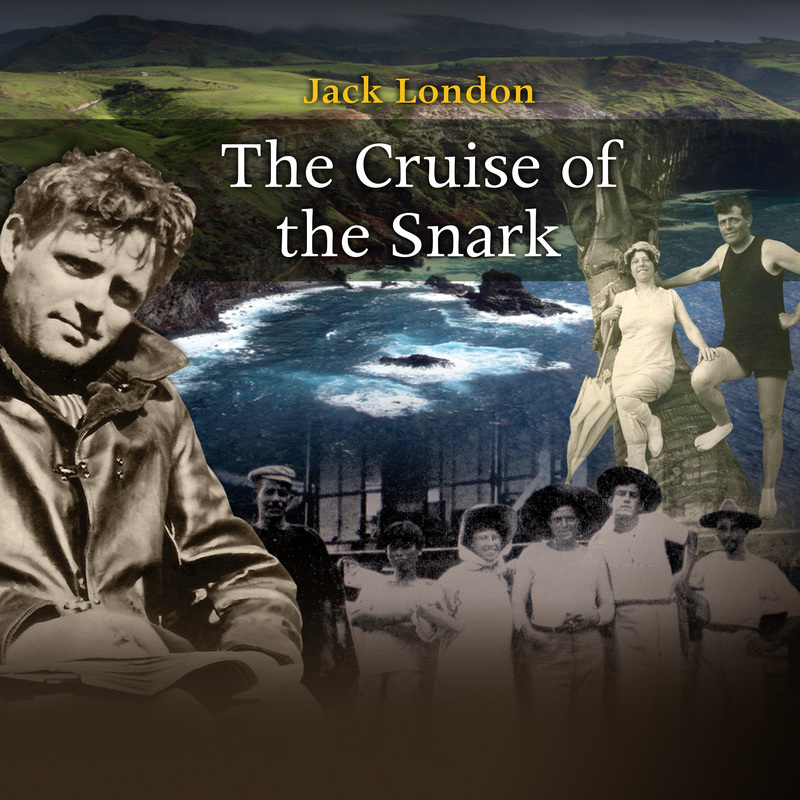 PS: Our Listen2Read audiobook of the month is “The Cruise of the Snark” by Jack London. If you ever dreamed of having a sailing adventure – this wild South Seas true story is a textbook of what NOT to do. You can download it at the link at the bottom of the page. 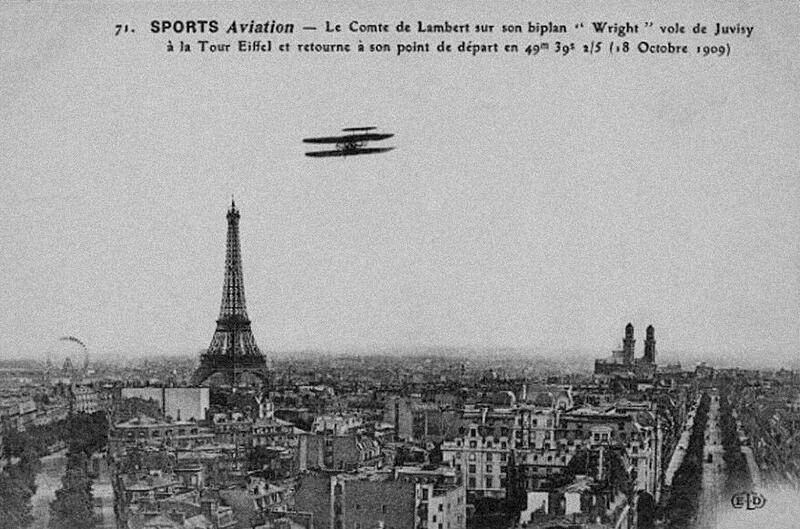 Wright flying machine circles the Eiffel Tower in 1909. 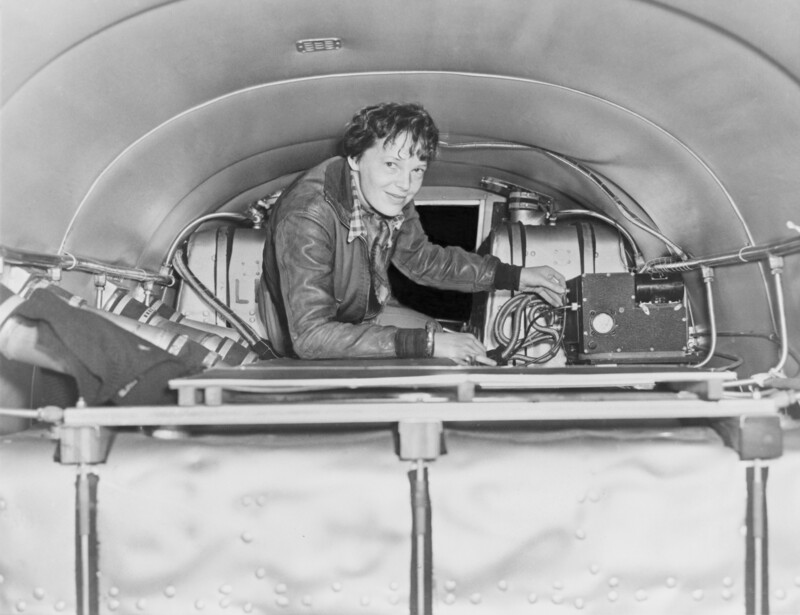 It’s Women’s History Month and I’ve been researching some of the women pioneers of aviation. 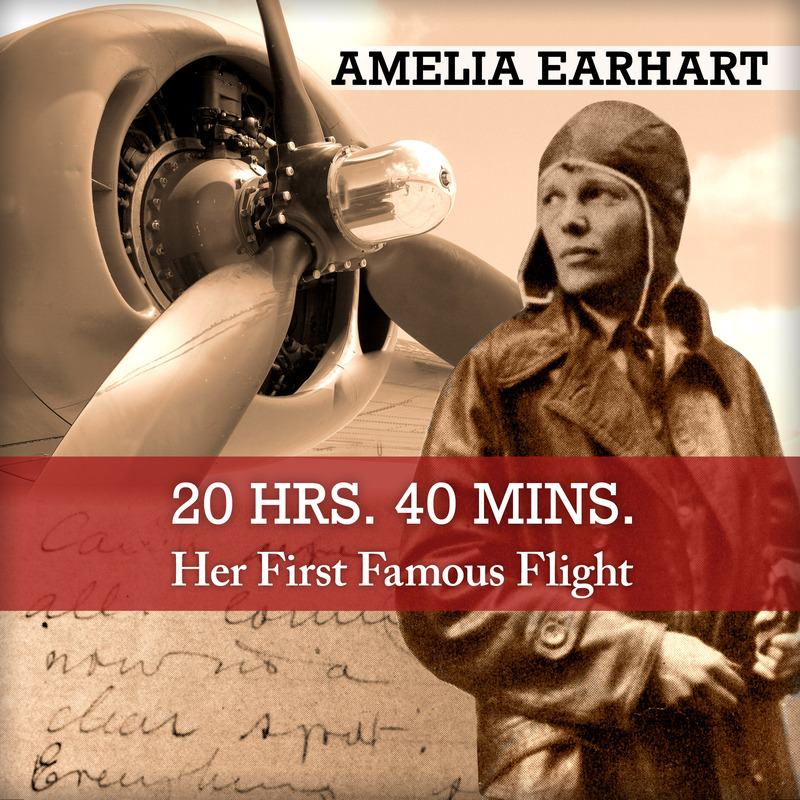 Perhaps the most famous woman aviator was Amelia Earhart and I have been fortunate enough to publish an audiobook of one of her memoirs, “20 Hrs. 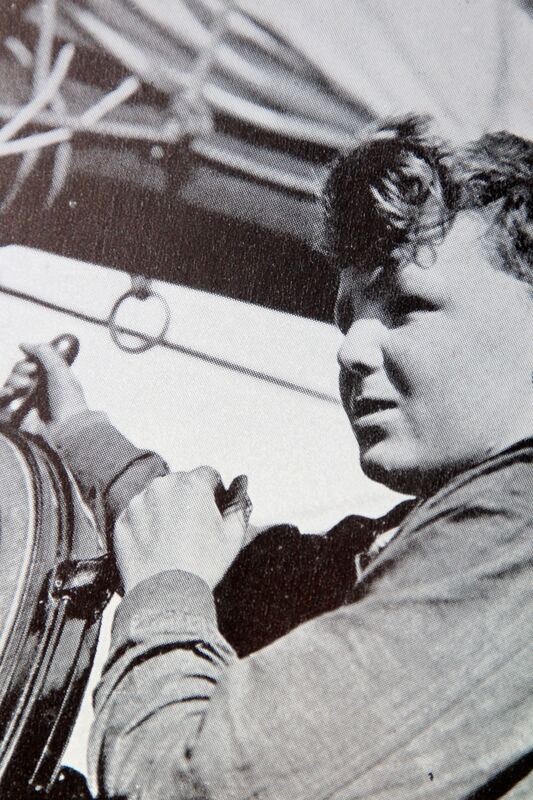 40 Mins.” But Earhart followed a long line of women pioneers. Consider, for example, the French actress Raymonde de Laroche, who looked up one day in October,1909, and saw the miracle of a lighter than air machine flying high in the air above Paris, making a circle around the Eiffel Tower. Raymonde de Laroche, the first woman to pilot an aeroplane in 1909. The flight impressed Raymonde de Laroche, who was a socially connected lady. One evening she dined with her friend, Charles Voisin, who, with his brother, built aeroplanes at Chalons, 90 miles from Paris. He agreed to give her flying lessons– but there was one big problem: his currently available aeroplane had only one seat and carried no passengers. The solution: Voisin would teach de Laroche by yelling at her over the sound of the motor. She would sit in the plane, he would be close to the plane on the ground, yelling instructions on how to operate the controls, to keep the plane even and level once it was in flight. However, Voisin forbade Laroche to actually take off into the air, because that would be too dangerous. 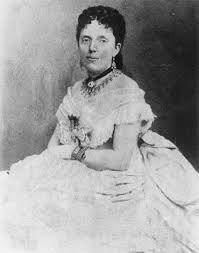 But Raymonde de Laroche had an independent mind. On October 22, 1909, once she gained confidence in operating the plane on the ground, there was only one other thing for her to do – fly! She took off into the air and flew the aeroplane 10 to 15 feet above the ground for a distance of about 300 yards, before safely bringing the plane back to earth to the exasperated Voisin. 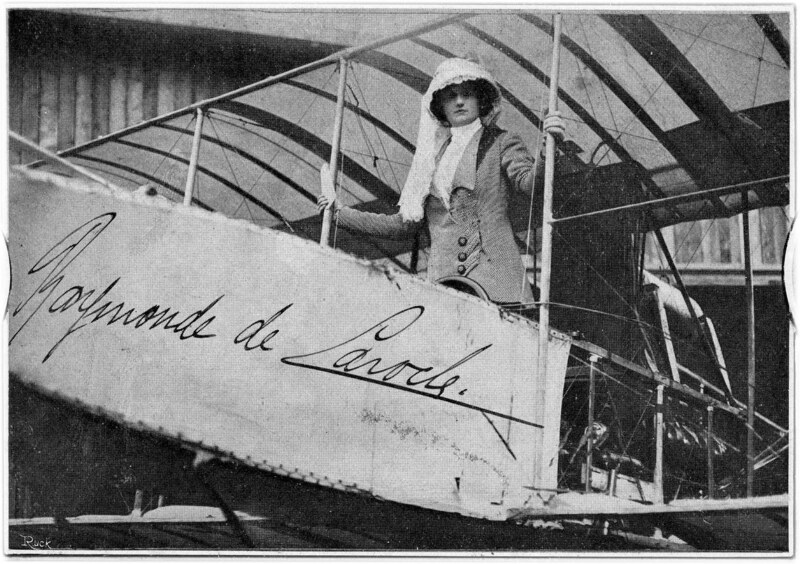 De Laroche poses with her Voisin aeroplane. Raymonde de Laroche didn’t know it at the time, but she had become the first woman to fly an airplane. There had already been women passengers in a plane flown by a man, but Raymonde de Laroche was the first woman to actually fly a plane by herself. 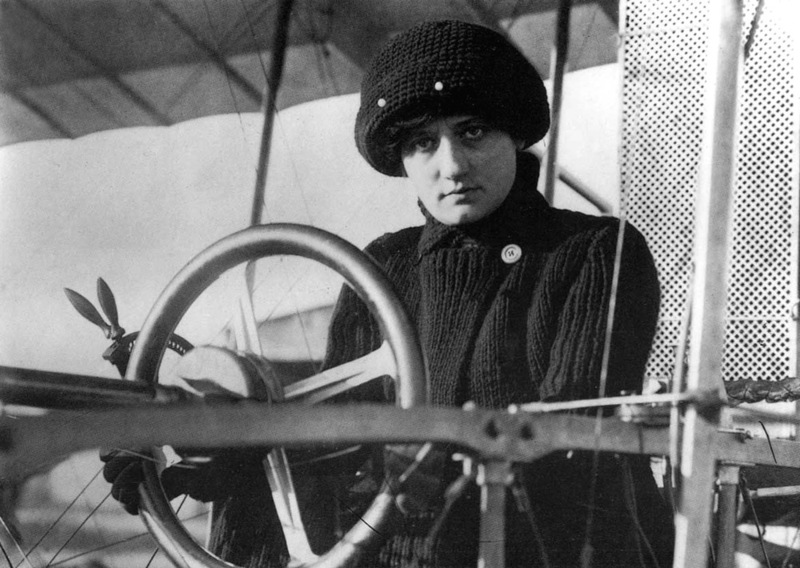 Five months later, she formalized her position by obtaining a Pilot’s License, becoming the world’s first licensed female pilot, receiving the Aero-Club of France License Number 36. Women of Aviation Worldwide Week is held on the week of March 8 in her honor and to raise awareness of the opportunities in aviation for women during Women’s History Month. 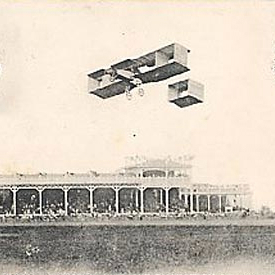 Harriet Quimby flying an early aeroplane. A year later, in August 1911, the first American Woman pilot received a US Pilot’s license from the Aero Club of America. Her name was Harriet Quimby. Before she began flying, Quimby had a successful career as a theatre critic for Frank Leslie’s Illustrated Magazine, a very popular weekly of the time. 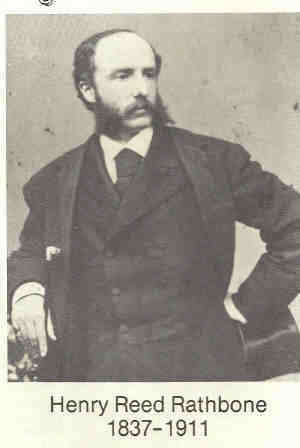 Quimby also wrote screenplays for films that were directed by pioneering director D.W. Griffith for Biograph studios in New York, before the industry moved West. 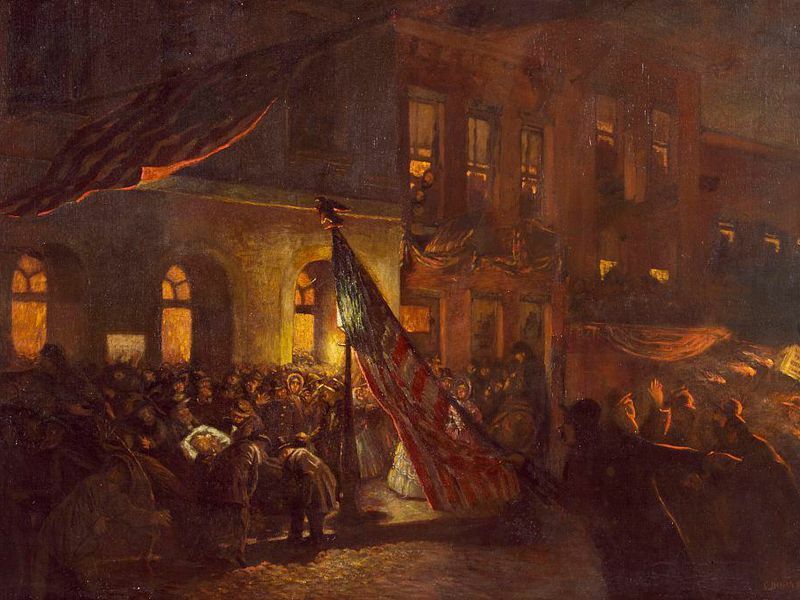 Crowds cheer Harriet Quimby after she successfully lands in France. On April 16, 1912, Harriet Quimby became the first woman to fly the English Channel from Dover, England to Calais, France, about 22 miles. This followed the flight in 1909 of the first man to fly the Channel, Louis Bleriot. 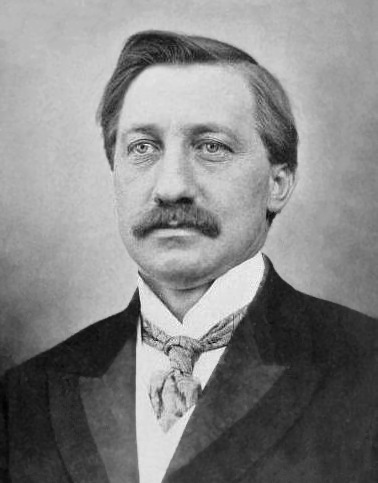 In fact, Quimby borrowed one of Bleriot’s aeroplanes for the flight. Her flight time was one hour and nine minutes. Quimby’s accomplishment should have made her an international heroine, but, sadly, the Titanic disaster took place the day before and wiped her news out of the papers. 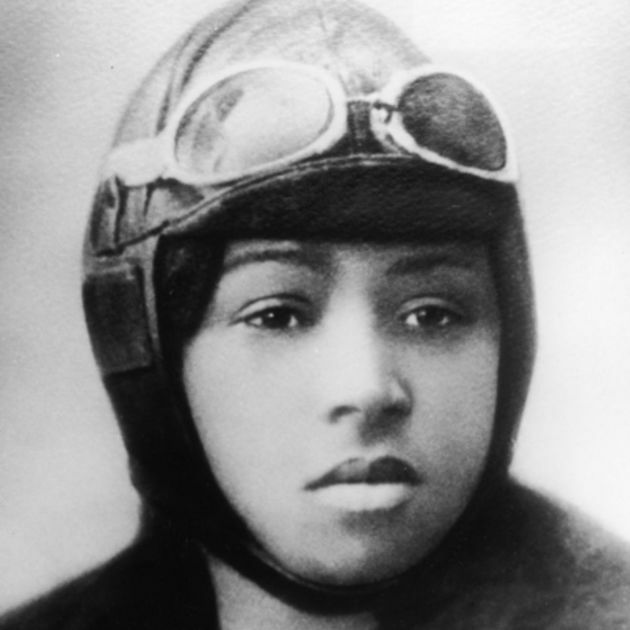 The first African American woman to hold a pilot’s license was Bessie Coleman, who was also part Native American. Coleman obtained her International Pilots License in 1921 and she did it the hard way. The daughter of two southern sharecroppers, Coleman grew up in poverty, but she knew how to work hard and she saved her money. Because of racial prejudice, Coleman was denied entry to American flying schools. So, this amazing woman traveled to France, learned to speak French and studied at the Coudron Brothers flying school at Le Crotoy. 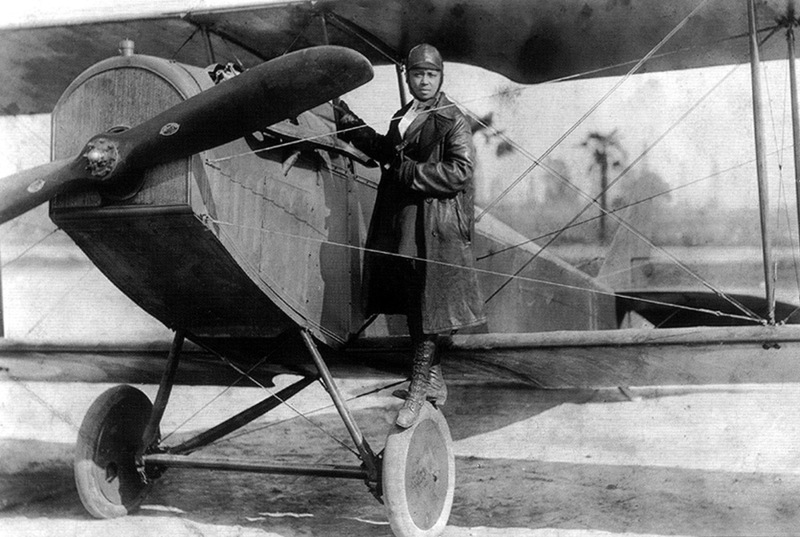 Bessie Coleman stands on a plane she flew in 1922. 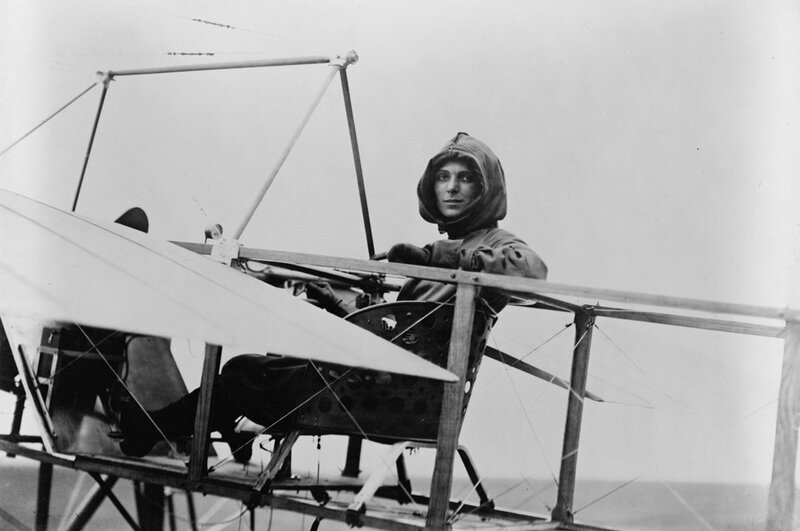 American women have been deeply involved in aviation from the very beginning. 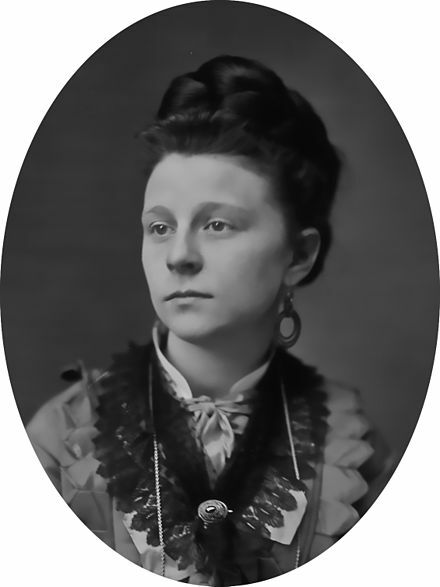 Katherine Wright, sister to Wilber and Orville Wright, was instrumental in the Wright Brothers experiments and the establishment of their company. 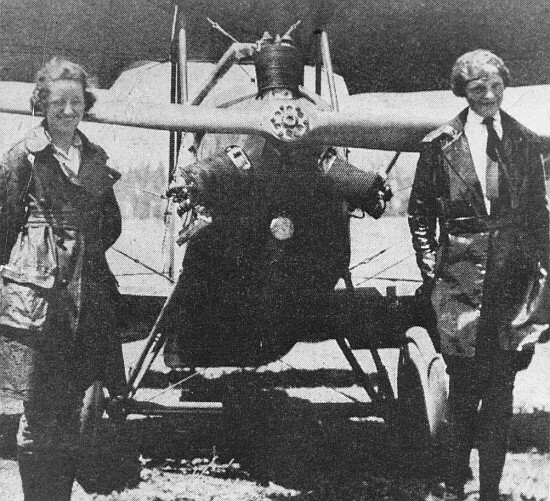 Amelia Earhart (right) with her flying instructor Neta Snook. Probably the most famous American Woman pilot was Amelia Earhart, an adventurous young woman, who had taken up flying as a hobby and was well known in flying organizations. Earhart supported herself as a Social Worker at the Dennison House, a settlement house in Boston. In 1927, after Charles Lindbergh successfully flew solo across the Atlantic Ocean and became a national hero, Florida socialite Amy Guest felt that whatever a man could do, a woman could do. 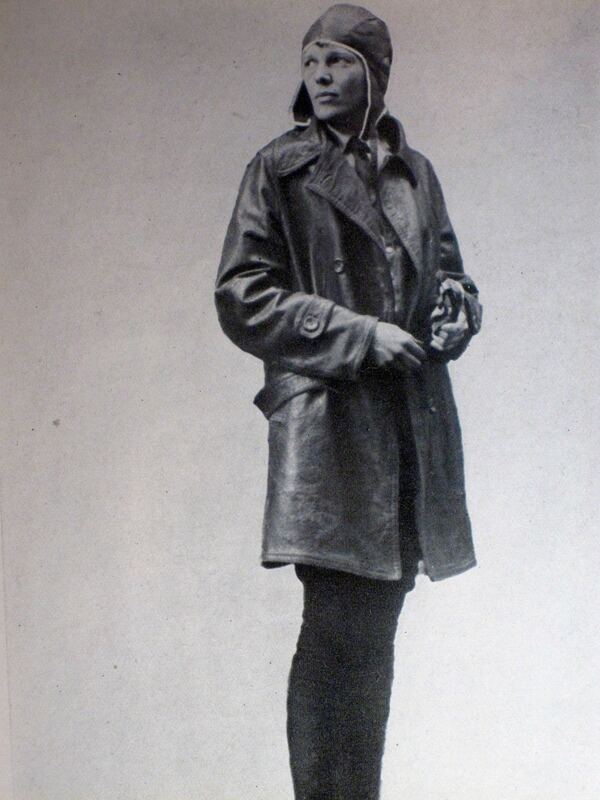 Amelia Earhart in leather coat she wore crossing the Atlantic. Guest made plans to be the first woman to travel by plane across the Atlantic Ocean. 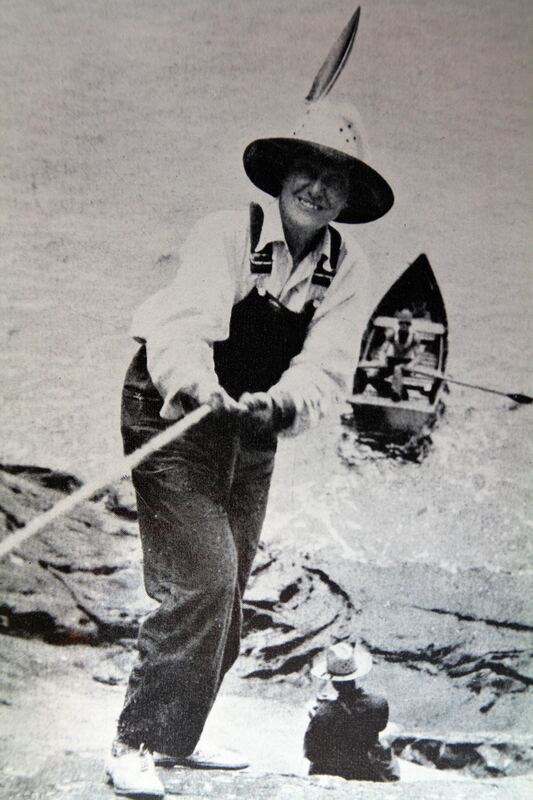 She bought a plane and hired a pilot, Wilmer Stutz, and mechanic, Louis Gordon. Mrs. 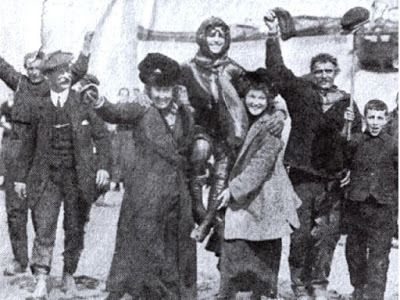 Guest saw herself as being only a passenger – but still the first woman to fly across the Atlantic. Eventually, her family persuaded her not to take the risk and Amelia Earhart, was chosen to take her place and join the crew on this very dangerous flight. Mrs. Guest engaged the services of Charles Lindberg’s publicist, George P. Putnam, to handle the publicity of the Earhart flight, because of his success in publicizing Lindberg’s flight and the post flight excitement. If you would like to see the actual take off of Amelia Earhart in her historic flight across the Atlantic in the “Friendship,” I have obtained the film and have included it in a promotional video for our Listen 2 Read audiobook by Amelia Earhart, “20 Hrs 40 Mins, Our Flight in the Friendship,” where she describes her life and her historic flight. Sadly, all of the above women, except Katherine Wright and Neta Snook, perished in air crashes during this very experimental time in the history of fight. But all of these women aviation pioneers were blessed with a dream and did whatever it took to pursue their dream. And I believe that anyone who follows their dream is an inspiration for all of us.